What methods exist for checking floor vibration of light-frame wood structures? Vibration of light-frame wood floor construction can be a significant occupant comfort issue. However, achieving acceptable levels of floor vibration is not a code requirement. As such, it is possible to design a code-compliant wood floor structure that produces annoying or unacceptable levels of vibration due to standard foot traffic. Several vibration analysis methods have been published, each of which takes into account some or all of these variables. What method should be used to determine vibration performance of a floor? The two most common methods for analyzing and limiting floor performance for vibration are deflection limit and floor frequency. Matching the consensus of the FPInnovations text, some engineers conclude that the live load deflection limits mentioned above can be an effective vibration control measure for spans up to about 22′. However, for spans above 22′, some vibration control calculations show that deflection limit may still be an ineffective method of controlling vibration. Perhaps the most widely known frequency-based vibration analysis method today is that from Woeste and Dolan. Their method, developed by Thomas M. Murray in the article “Building floor vibrations,” which appeared in Engineering Journal in 1991, calculates the fundamental frequency of the typical floor joists based on the floor joist stiffness, span and applied dead loads. This method recommends limiting floor frequency to a minimum of 14 Hz for furnished rooms or 15 Hz for empty rooms. Past experience shows that this can be an effective quick check tool but it can underestimate the floor’s performance due to unaccounted for measures such as the presence/lack of a floor topping, blocking, ceiling, etc. In order to address what they consider perceived inadequacies with the above mentioned analysis methods, FPInnovations has proposed utilizing a new analysis method. This method calculates the maximum permissible span for a given assembly based on a combination of floor stiffness and mass, with options for increasing the allowable span if blocking, bridging, strong backs or other stiffening measures are used. 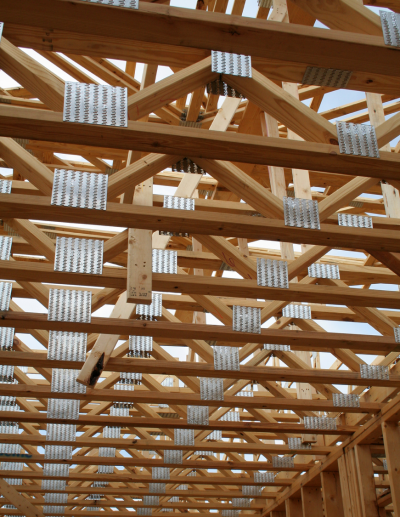 Several engineered wood floor joist and truss manufacturers have developed proprietary software which includes floor performance ratings that take into account many of the same considerations as the FPInnovations method. These ratings are based on perceived acceptance of a floor’s vibration performance. Examples include Weyerhaeuser’s TJ Pro Rating and Redbuilt’s Floor Choice Rating. Although established by the steel industry, some designers use the vibration control information in AISC Design Guide 11 for light wood floor framing. Redbuilt has published a short document on floor performance. Weyerhaeuser has published a technical bulletin on floor performance. A related question that arises less frequently is that of vibration performance of wood beams supporting floor joists/trusses. The Dolan method mentioned above does provide an equation for checking the combined floor vibration performance of a typical floor framing member with the vibration performance of the supporting beam, as does AISC Design Guide 11. However, checking wood beams for vibration is not commonly done. Best practices include limiting deflections and verifying that the combined performance of the system will still produce acceptable levels. Our technical experts offer free project support from design through construction, on issues ranging from allowable heights and areas to structural design, lateral systems and fire- or acoustical-rated assemblies. Q: What design and detailing considerations exist when splicing shear wall top plates at wall discontinuities?